Every year, after the last frost (or at least what I hope is the last frost), when the evening temperatures are in the 50s and the daytime temperatures are in the 80s, I get excited. It is time to start gardening, and boy do I love gardening! This weekend I decided it was time to add some new strawberries to my strawberry bed, so I visited my local nursery. I bought the strawberries, and only the strawberries, but on the way home I knew that I had been bit by the gardening bug. I rediscovered something about local nurseries. While I love large home improvement stores, and I also regularly buy from their garden sections, they are not necessarily stocked with plants and trees that will thrive in that area (thank you Rosie on the House for that wonderful, eye-opening piece of information). Most local nurseries, however, purchase only what can grow in that region. While this may not be as helpful for those of my readers who are in more temperate regions of the world, it is very important for those of us in Phoenix. We have a unique climate that can make gardening a little tricky. Local nurseries provide the local plants and expertise to help you be successful. Aside from this, my experience has been that everything at the local nursery is either priced the same or lower than what I find at the home improvement stores. What two- and four-year-olds don't like dirt? So while my wife took our six-year-old to a birthday party, I had a gardening day with the younger two. We went back to the nursery (Summer Winds Nursery is my new favorite local Arizona nursery) and loaded up with fruits and vegetables (actually, I was somewhat restrained and only got an apple tree, two tomatoes, and some basil. But I wanted to load up with a lot more). While at the nursery, my four-year-old kept pointing to fruit and vegetable seedlings and identifying them. I was getting such a kick out of her enthusiasm, and several of the nursery employees commented on this as well. One gentleman said that he was so excited to see kids get enthusiastic about gardening at such a young age. I wanted to stay at the nursery all day and continue to load up the cart, but I figured we had enough to keep us busy for the day, so we headed home to get our hands dirty. We spent the day planting, playing in the dirt, composting, and picking lemons (we've picked close to 400 pounds of lemons so far this year, with many, many more still on the tree. If you live in the Phoenix area and would like free lemons, just leave a comment here or on Facebook). Most importantly, we spent quality time together. Because as much as I love gardening and being outside, I love spending time with my family that much more. Gardening with my kids is well worth the crushed baby strawberries, the plants planted a little too deep, the worms that are accidentally dropped down my shirt, and the "sword fighting" with pieces of PVC. 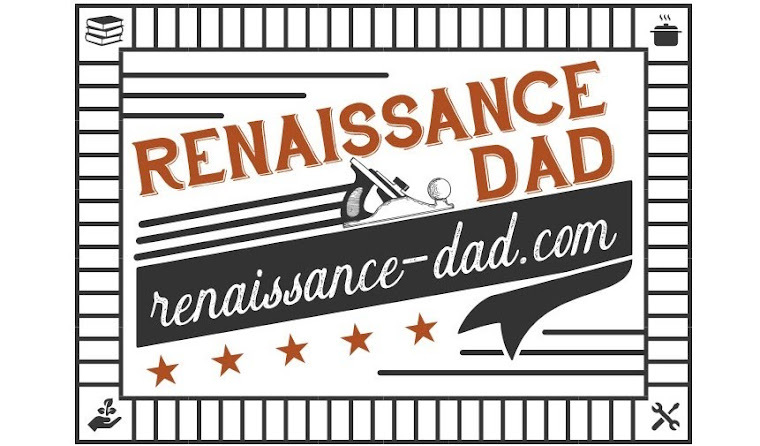 This is the time of year that I absolutely love being a Renaissance Dad. When my wife and I were first married, we heard about the idea of powering a house with solar panels. We immediately used our dial up internet to slowly read about residential solar production. Through our investigation, we discovered that the cost for solar panels was more than you could save in a lifetime of electrical bills. Yikes! We believed at that time that we would probably not be able to ever afford to have solar panels on our house.Against all hope, we still put it on a list of life goals and stuck it next to our dinosaur computer. While solar panels are still relatively expensive, we decided to look into leasing them and ultimately ended up with solar panels on both of our Arizona homes using Solar City. While we generally don't like to lease anything, we realized that leasing solar panels does not cost us any money in the long run. In fact, it actually saves us money when our monthly electrical bill and lease payment are combined. We actually have several months in the year with a $0 electrical bill (only paying the lease amount on the solar panels) which is absolutely fantastic. In the last year, we have saved an average of $50 per month by generating solar power ($600 over the past year). We have generated 14,781 kWh of power in one year, which seems to be enough to power a small town. Solar City's fantastic app for iPhone (or Android) enables me to monitor my solar usage, see how much I have generated for a day, week, month or year, and check to make sure that the system is working properly. Solar City is a company that was started by two brothers who wanted to make solar affordable for the average homeowner (if only one of MY brothers had talked me into doing something like this). Their engineers work with the homeowner to develop a system that works for the home and lowers the monthly electrical bill by more than the lease payment. They also take care of all permits, installation, inspections, and follow up. And, according to a different company that I spoke with, they are the only solar provider that handles their own financing, which means that they are more affordable. In essence, Solar City is a fantastic company to work with, and they make every aspect of going solar easy. They currently provide solar systems in 15 states. Here's what having a solar system means to me as a father. It means that I am reducing my carbon footprint by producing a good portion of the electricity my family uses (so I can feel good about recharging the batteries for countless annoying talking toys). I am much more conscious with the electricity that I use, knowing that what we produce goes that much further if lights are turned off or we open the windows to help cool off the house. And I love talking about electricity with my kids. In fact, my kids, ages six, four, and two, love looking for solar panels as we are driving around. It is kind of the hippy version of "Slug Bug," although I suppose "Slug Bug" was kind of a hippy thing to begin with... Anyway, the logical side of me loves saving money and the environmental/fatherly side of me loves doing something good for the planet. If you are interested in learning more about Solar City and whether or not they are the right company for you, please use the following link: http://share.solarcity.com/renaissancedad For every person who signs up for a solar system through this link, Renaissance Dad will donate $100 to a local charity.